"Tucson, Arizona - Retired Air Force Lieutenant General Hewitt T. Wheless, a highly decorated World War II bomberpilot, has died at the age of 72. 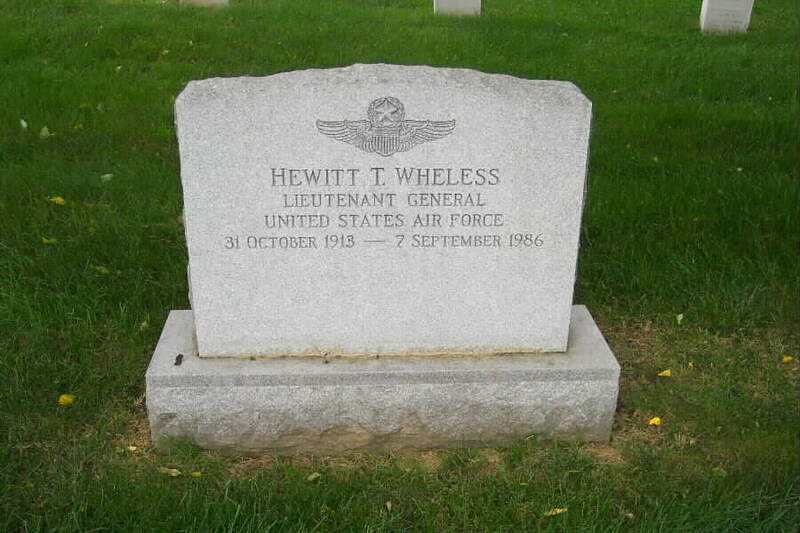 Wheeless, who died on September 7, 1986 of congestive heart disease, retired in June 1968 as Assistant Vice Chief of Staff of the Air Force. "A native of Menard, Texas, he received the Distinguished Flying Cross from President Franklin D. Roosevelt for a heroic 1942 flight over the Philippines in a B-17 bomber. He was also awarded the Distinguished Service Medal, the Legion of Merit, the Flying Cross and the Air Medal. He later flew B-29s in the Pacific Theater. He was a member of the Gates Learjet Corporate Board of Directors until 1980. He is survived by his wife, Susan; a daughter; two grandchildren; and three nieces." General Wheeless was buried in Section 30 of Arlington National Cemetery.